Well, there goes my dream of Rarity and Applejack starring in a Midnight Cowboy parody, at least for now. Fun fact: a hinny is the offspring of a female donkey and a male horse. They’re rarer than mules, which are the offspring of male donkeys and female horses, because of the size differences between the two animals means that … and that got horrifically off topic fast, didn’t it? The gist of this episode is that Pinkie Pie discovers that she probably is a distant cousin of the Apples. There’s only one pony that can reveal the truth, so it’s time for Pinkie and the Apples to put on their version of Vacation, except, spoiler alert, Granny Smith does not die. The episode ends ambiguously, which is a bold choice for a kid’s show, though there are subtle hints that Pinkie and Apple family historian Goldie Delicious at the end of the road share certain abilities. Has absolutely nothing to do with the “keys of friendship” story arc, but is a fun episode nonetheless. "It Ain’t Easy Being Breezies"
In this episode, Fluttershy is trying to help out a group of bizarre magical creatures called breezies who are an apparent cross between insects and ponies. And you thought the hinny was disturbing. Anyway, the leader of the breezies, Seabreeze, may actually be my favorite new character of this season; he’s a disgustingly cute critter who talks in a hilarious accent, but apparently doesn’t realize how adorable he is when he’s angry and at one point apparently strings together a collection of choice breezie four letter words. Truthfully, he reminds me of myself, except for maybe the adorable part. For the finale’s new villain, My Little Pony goes old school, and brings back the original pony villain, Tirek, to threaten all of Equestria. Discord is originally sent to stop him, but that backfires in the most expected way possible when Tirek offers the chance for a villain team up and Discord accepts. Tirek’s thing is that he absorbs the magic of ponies, with his ultimate goal being absorbing the alicorn princesses’ magic. Luckily, he doesn’t know there’s a fourth princess, so, in a desperate gambit, Celestia, Luna and Cadance transfer their power to Twilight. Well, that ends up not being a very well thought out plan, as Discord immediately tells Tirek what’s up, and the show runners decide to go for broke. 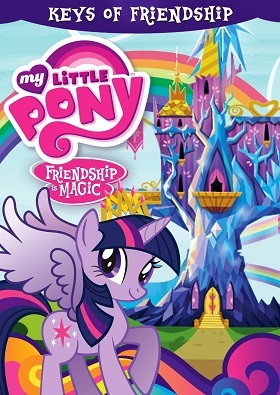 I remember watching “Magic Duel” and getting a glorified pie fight; on one hand, I was kind of disappointed I didn’t get EPIC ponies, but also kind of relieved, because, after all, it’s really not my show to run, and if the people behind the show wanted to keep it on a smaller scale, that’s also perfectly fine. However, for this episode, they decided to go full on epic, as Tirek and Twilight blow up half the surrounding countryside. Seriously, there’s more beam spam in this episode than a Heisei Godzilla flick. At one point, Twilight’s library is hit (there’s $111,343 in property damage right there), and the show does something actually really cool. Twilight (and the writers) don’t forget Owlowiscious; Twilight dives in and saves him. It’s a nice little detail. Another nice little detail is that, in the end, all the pyrotechnics end up not mattering; Twilight beats Tirek by being a good friend. Tirek of course betrays Discord, and though it was pretty obvious all along, it still is a wonderful beat when Twilight still calls him a friend. So, there’s a sing-along, for Rarity’s “Generosity” song from “Rarity Takes Manehattan”, and … wait, no coloring sheet this time. Jeez, what a rip off. Well, here’s the rather short ‘Rainbow Rocks’ teaser trailer. You can find more on the newest pony movie minus ponies here. My Little Pony: Equestria Girls: Rainbow Rocks will be coming to theaters September 27.